Although quite rare in the United States, it would be hard to find a table in Jamaica without a bottle of this hot sauce on it. That about says it all. Ya mon! 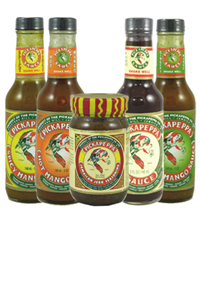 Experience the Original Red or Green Pickapeppa, or get crazy with the Ginger, Spicy Mango or Hot Mango! Pickapeppa has also created a one of a kind Jerk Seasoning that is extremely good and has a wonderful traditional flavor! We ordered 5 bottles of the Spicy Mango....amazing flavor, when the package arrived today, it was Ginger Mango...awww...but Tammy helped us out quickly and has a new shipment of Spicy Mango on it's way. Thanks for the great customer service! Super FAST SHIPPER! I LOVE this product! I can't find it in Chicago! THANK YOU! I'm a customer for life! This is a very good, flavorful sauce. It is not, however, very hot. It would make an excellent marinade for chicken, pork, etc.